I’m pretty sure I’m not the only one who has a hard time staring at this bike because of all the details. With most of my articles that Chris and Heather ask me to write, I take a look at the pictures and compare some of the build details with things or tricks I’ve seen before. More times than not I have used most of them to a certain degree but not with this bike. 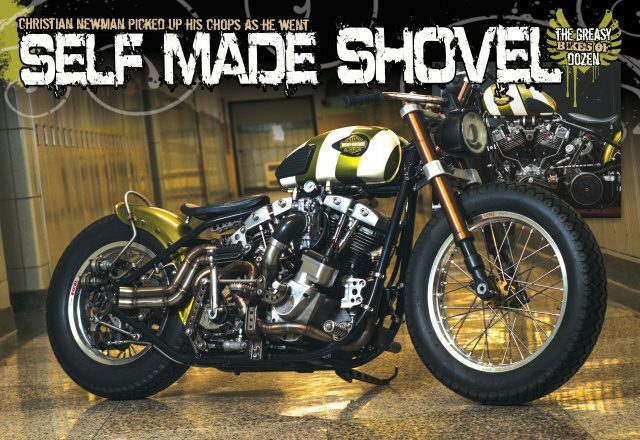 What started life as a 1978 Shovelhead is now a rolling piece of art that performs just as good as it looks which is exactly what Christian Newman had in mind when he started on this build. Believe it or not, this is his first bike build. He started fabricating a few parts for Hondas here and there but had never done any framework or intense fabrication except for a few relatively performance-based import cars. Newman found working with bikes to be a more satisfying outlet because of the exposed nature of most the mechanical pieces. Being an engineer by profession, it really intrigued him and was a primary focus during this build. 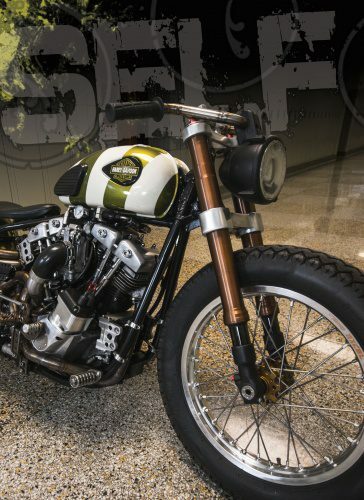 The Greasy Dozen Collective was the inspiration for this build and Christian says it was a great time where he got to meet a lot of great people. It was truly his introduction into the world of custom motorcycles. This being his first Harley, he had hoped he would be able to just reuse the engine and transmission, but as with most projects, he ended up rebuilding them both from top to bottom. Christian would like to thank BA Enterprises in Lockport NY for helping with advice while he took this on. Since he had never used a mill and had only a few minutes on a Tig machine, it was a learning process from the start as were the engine and transmission. Drawing from his BMX days, Newman fabbed the handlebars, but the mounting was a bit unusual as the risers were the first part that he ever milled. The triple trees were next, and over the next six months, he began to get a little more experience and proficient with the tools and machines. So, by the time he made the foot controls, exhaust, axles, oil cooler mounts, fuel tank parts, kickstand, chain tensioners, motor mount, caliper mount, license plate mount, sissy bar and seat suspension the doubt he had at the beginning of this build was long gone! Most of these pieces were made from stainless steel, not only because of strength but for the raw, exposed look instead of painted pieces. The BSA C15 gas tank was a first as well. Christian had never really done much sheet metal work, and while he says it wasn’t too complex, he remembers it was challenging at the time. As with most rigid frame bikes, vibration has a way of breaking anything brittle like tank mounts so while he was at it he also he sectioned it for an oil tank. Some of you may be wondering how it functions with the turbo and I was one of them. Unlike a conventional carbureted bike this fuel system uses an electric fuel pump which feeds a 1:1 rising rate regulator, which keeps fuel pressure about 5 psi above boost pressure at all times, this is essential in keeping the fuel from being forced out of the carb by positive manifold pressure. The HSR42 Mikuni carburetor is set up to be a blow thru design, and the timing is controlled by a Morris Magneto but for a true race application Christian says an electronic ignition with a boost retard would be needed. The turbo is actually mounted under the seat and receives a high pressure (for a Harley) feed from the S&S HVHP pump, a restrictor was added to the top end feed to prevent over oiling, and he added custom external head drains to help the process as well. Oil also flows through an external oil filter as well as an 8-row oil cooler. The bike was street tuned only with a wideband O2 sensor. While it runs well, Christian says he doesn’t know the actual power it makes. Now for a guy who builds a bike as clean and meticulous as this, I had to laugh at that statement. I asked about the frame because I didn’t recognize its origin and of course, Christian had modified it. He started by deraking the neck by 5 degrees to accommodate the 2” under GSXR 1000 front end and adding a set of one-off axle plates. A first for this writer was the rear taillights that were takeoff items from a British Armored Personnel Carrier which look they fit perfectly with the bike! The paint is PPG Jeep Rescue Green that was done in record time by Andy Zeon of Zeon’s Collision. Even though I agree with the superstition of about green bikes, I’ll make an exception this time. As I look over the images of this machine, I’m personally impressed with the attention to detail on the stainless brackets as well as the custom mid controls and the rear exhaust mounts by the axle plate. Another piece I was drawn to was how Christian utilized a gear type adjustment for the rear wheel. I could go on forever about the small details that separate this bike from the rest, but I’ll let you, the reader, take your own time to recognize the true talent and skill that went into this bike. Christian would like to thank Bear (Old Bike Barn, Greasy Dozen Collective) Postprocess Technologies, BA Enterprises, Zeon’s Custom Paint and Kickstart Cycle for all of their help with this build! 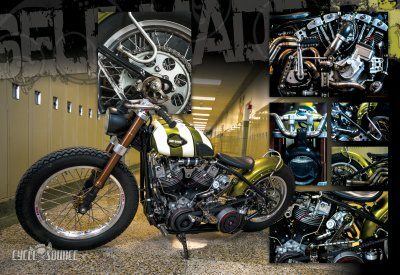 It’s refreshing to see a bike of this caliber being built. I for one am looking forward to seeing what else Christian comes up with next!! 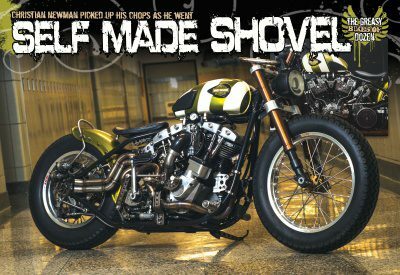 This entry was posted in Feature Bikes and tagged August 2018 Feature Bike, Back Issue, Cycle Source, Cycle Source Magazine, Harley, Harley-Davidson, Self Made Shovel, Shovel, Shovelhead. Bookmark the permalink.